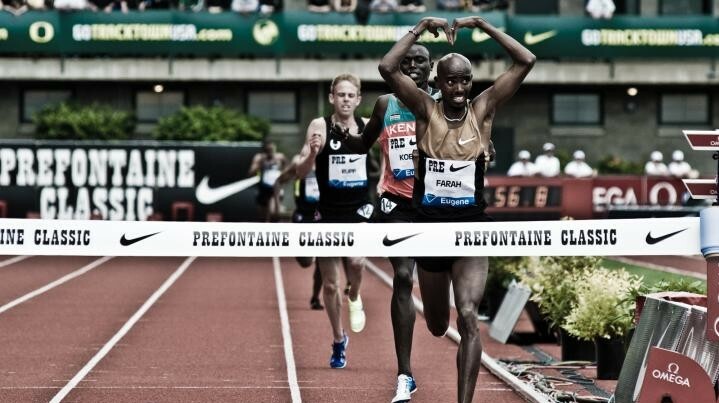 The Prefontaine Classic may have come to an end yesterday, but plenty around the nation are still buzzing about the performances that were turned out at the 2013 meet. One of the main highlights for the thousands in attendance was high school phenom Mary Cain‘s showing in the women’s 800 meters. Competing in a field that included Francine Niyonsaba (BDI), Brenda Martinez (USA), Janeth Jepkosgei (KEN), and Alysia Montano (USA), Cain used a fast field to finish with a time of 1:59.51, a personal best for the budding track and field star that also saw her set the high school and U.S. Junior records in the event. 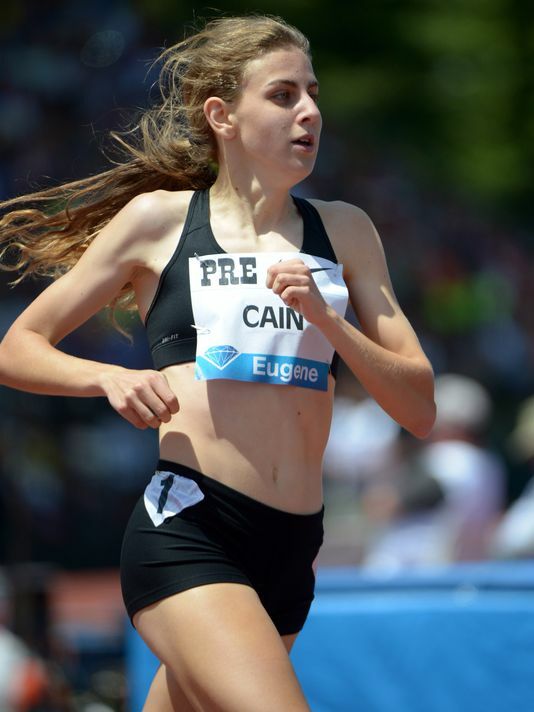 Finishing up her junior year in high school, Cain has yet to announce where she will attend college, though there were plenty of fans encouraging her to bring her talents to Eugene, as they familiarized her with the “Come to Oregon!” chant. The first high schooler to run the 800 meters in under two minutes, she bested the previous high school record of 2:02.04 that was set by Amy Weisenbach in 2011. Placing fifth overall, she finished right behind Montano, who edged Cain with a time of 1:59.43. After the race Montano gave her signature orchid to the high school phenom, signaling the emergence of a great track and field athlete. Coming in first place in the women’s 800 meters was Niyonsaba, who finished with a time of 1:56.72 to set a new meet record while becoming the world leader in the event. Aside from Cain’s astonishing finish and Niyonsaba’s world leading finish, plenty of other athletes set records and bests at the 2013 Prefontaine Classic, with one area record being set, 13 world leaders established, five meet records set, and three national records broken. Setting the lone area record at the meet, Mutas Essa Barshim (QAT) cleared a height of 2.40 meters in the men’s high jump to overcome a strong field that included Erik Kynard (USA) and Derek Drouin (CAN). His clearance also made him the world leader in the event while also setting a new meet record and national record for his country. Drouin’s clearance of 2.36 meters set the new Canadian national record. Silas Kiplagat (KEN), meanwhile, established a world leading time in the Bowerman Mile with a time of 3:49.48. He narrowly edged Asbel Kiprop (KEN), who finished right behind Kiplagat with a time of 3:49.53. Aman Wote of Ethiopia placed third in the event with a time of 3:49.88, a personal best for the 29-year-old. Hansle Parchment (JAM) also established a world leading time in the 110 meter hurdles, finishing with a time of 13.05 seconds that also saw him set a new Jamaican national record. Renad Lavillenie (FRA) finished just as he did at the Olympic Games, placing first in the men’s pole vault to once again overcome Bjorn Otto (GER) and Raphael Holzdeppe (GER), who also finished just as they did in the past Olympics. Lavillenie cleared a height of 5.95 meters to become the world leader in the event this year. Aleksandr Menkov (RUS) took home first in the long jump, as he reached a distance of 8.39 meters to become the world leader in the event. Mauro Vinicius Da Silva (BRA) placed second in the event, reaching a distance of 8.22 meters. The men’s discus was won by Robert Harting (GER), who also became a world leader, throwing a distance of 69.75 to overcome Piotr Malachowski‘s (POL) distance of 68.19, a seasonal best for the 29-year-old. James Kiplagat Magut (KEN), who did not finish in the Bowerman Mile, made up for his performance in the men’s international mile, becoming the world leader with a time of 3:55.24. Edwin Sheruiyot Soi (KEN) became the world leader in the men’s 5,000 meters, finishing with a time of 13:04.75 while Kenenisa Bekele (ETH) finished with a time of 27:12.08 to become the world leader in the men’s 10,000 meters. Several women’s records fell at the 2013 Prefontaine Classic as well, with Niyonsaba’s impressive performance leading the way. Aside from her effort, meet records in the women’s javelin and 1,500 meters were also set, as Christina Obergfoll (GER) threw for a distance of 67.70 in the javelin and Hellen Obiri (KEN) ran a 3:58.58 in the 1,500 to set the new meet records. Tirunesh Dibaba (ETH), meanwhile, became the world leader in the women’s 5,000, finishing with a time of 14:42.01 to pace the field. A new world leader was also established in the women’s 400 meter hurdles, as Zusana Hejnova (CZE) finished with a time of 53.70 to see herself finish in first. Olha Saladikha (UKR) rounded out the new world leaders at the Pre Classic, as she reached a distance of 14.85 in the women’s triple jump for the leading distance.